Words with Friends – The originator. This game does what phones are supposed to do: encourage interaction with other people. I won’t go into some hack comedian diatribe about how at one point, phones didn’t have touch screens and hard drives; you would use them to call another person and actually talk to them. My, how the times are changing! (Okay, my old man rant is over now.) There are countless versions of this game from straight up knock-offs, to similar, but different spin-offs akin to Boggle. These apps all fit the role of classic games for a new generation who don’t want to excavate through their parent’s coat closets and dust off the random old board games. Wordscapes – If you don’t have the confidence to put your vocabulary to the test publicly with your friends, then you have an alternative. This game is designed more like a crossword puzzle if there were no clues and you could only use 6 letters to make words out of. It’s really easy to get sucked into. (I may or may not have completed over 300 levels in the span of a week.) This app offers a true test of your vocabulary. It’s also good at helping you guess if a word is real or not. WordsStory – I saw ads for this game for a while before I finally decided to give in and download it. And honestly, I probably would’ve passed on it if I hadn’t decided to write this post. Regardless, the concept seemed somewhat interesting, as you have to make words out of a set of letters that are provided, in order to help your character bust out of his prison cell. For instance, you might be given 10 letters, and you have to identify the word “spoon” from those letters so that your character can have a digging tool. Unfortunately, the concept and marketing are more appealing than the actual experience of the game play. The language is rough (to put it nicely), and the execution leaves a lot to be desired. It’s not a complicated game, but the lack of instructions and story are quite apparent and lead to the overall feeling that my original hunch was pretty accurate. Hard pass. TypoMan Mobile – The title could’ve been given more thought, and it’s really a disservice to the quality of the game. You always hear the cliché, “never judge a book by its cover,” which is a nice sentiment on not judging things that you aren’t familiar with. In the literary world, that saying does not apply. Books are purchased every single day solely based on their cover design. I imagine the same can be said of video games. A better title could give this game the boost it deserves. The game itself has a quirky uniqueness to it. The main character, often referred to as the hero in storytelling, is literally comprised of the word HERO. You run around and interact with the environment by using random letters that are placed throughout the level. Need to climb a ladder that’s too high for your character to reach? Find the letters to spell DOWN and the ladder drops to a usable height. Or you may come upon a platform that falls from above that has the word CRUSH on it. As it’s risen back to the sky, it takes the C with it, leaving you the instruction to RUSH before it falls again. It’s actually a brilliant idea. The controls are responsive, although the concept and story line aren’t as intuitive as I would like, with the game being so different from other games I’m used to playing. This game makes you pay attention and actually think about what you’re doing a little bit. Not that you have to be a mastermind to enjoy it, just not a lumbering automaton like I have become. And part of that is probably on me, because I’m used to mindless first-person shooter games or something where a lot of thought isn’t required. I’ve actually only spent a few minutes here and there with the first couple chapters of TypoMan, so I’m still in the learning curve part of it. Overall, based on what I’ve seen so far, this is a really fun, interesting game and I highly recommend it! 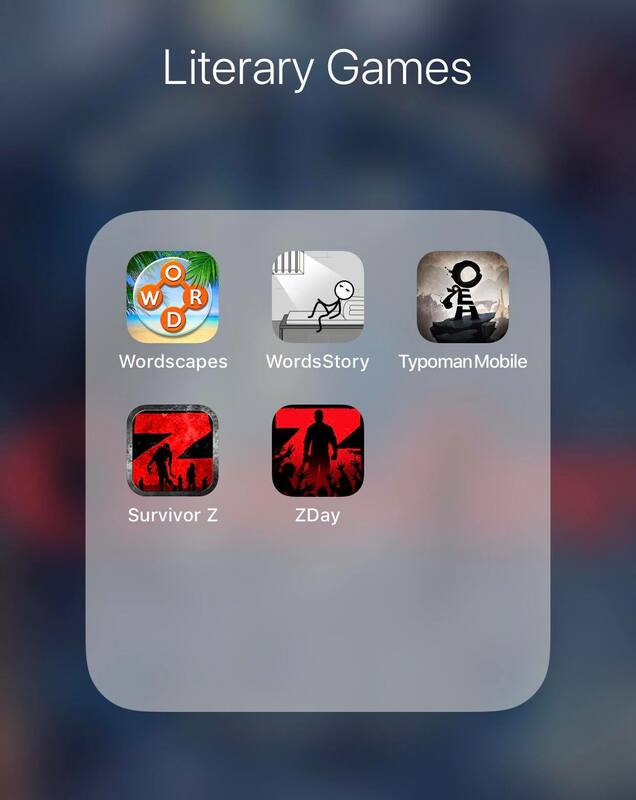 ZDay Survival Simulator & Survivor Z – Who didn’t love choose-your-own-adventure novels growing up? I would inevitably be dead by the time I made my second choice, which always left me going back and running through different decisions. Developers have toyed around with the possibility of adapting this concept to modern technology with minimal success. There are a few options out there for this type of app, with the most recognized probably being Choices. The downfall for that app is that I detest trashy romance novels, so that’s basically an automatic disqualifier for me. If that’s your thing, then go for it! I’ve heard rumblings that somebody out there is really close to cracking the code for applying this idea to audiobooks in a way that Alexa (or your home assistance of choice) would provide options for you to make as the story progresses, which could be interesting. This app sticks more closely to the traditional format of the good old-fashioned print stories. It’s presented in a way that kind of feels like a digital graphic novel. It’s set in the zombie apocalypse, which is a personal favorite of mine, so it already starts off with bonus points right out of the gate. You follow the story and it gives you a multitude of choices to make. Those decisions obviously determine how far you make it and how effective you are at surviving the apocalypse. Once you reach the end (whatever that looks like based on your choices throughout the story), you are even given stats for how long you made it, how many survivors you found, how many weapons you amassed, and how you rate as a survivor. It’s a pretty great app with a lot of fun scenarios for you to work your way through. Survivor Z appears to be the follow-up, but unfortunately, it seems to be pretty bogged down with bugs. I haven’t had much success getting it to load, which is disappointing based on how much I enjoy ZDay. My verdict on this one is to absolutely check out ZDay, and give Survivor Z a shot if you can get it to work for you. What are your favorite bookish apps that I didn’t include? Let me know in the comments below!